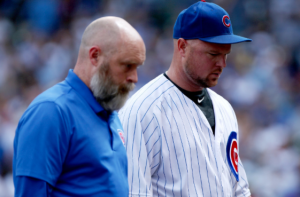 As they fight to keep the top spot of the NL Central, the Chicago Cubs have lost an important member of their starting rotation. The Cubs placed lefty Jon Lester on the 10-day DL Friday. Lester’s trip to the DL, his first since 2011, is related to both shoulder fatigue a lat issue. However, the Cubs believe Lester won’t miss more than one or two starts. Lester goes to the DL one day after a disastrous outing against the Cincinnati Reds. He lasted just 1.2 innings, allowing nine runs (seven earned) on seven hits. Before he could get out of the 2nd inning, Lester was removed from the game by the team’s trainer and sent to be examined by an orthopedist. The Cubs were understandably concerned after Lester left Thursday’s game following such a poor performance. But the reports coming out Friday have helped ease those concerns, despite Lester going on the DL. Maddon said Friday that Lester will miss a “minimal” amount of time. The manager explained that Lester wasn’t able to finish his pitches, leading to a drop in velocity. Maddon believes that small drop in velocity is what allowed Cincinnati hitters to get the better of Lester. Cubs President Theo Epstein added that Lester had been feeling the shoulder fatigue for a while and that now was the right time for him to receive some rest. Lester has been solid for much of the season. However, he’s had a few outings like the one on Thursday in which he got hit hard and made an early exit. Those few starts have caused his ERA to balloon to 4.37, far higher than we’re accustomed to seeing. Nevertheless, he remains an important part of Chicago’s rotation in the middle of a playoff race. With Lester hitting the DL, the Cubs have called of Rob Zastryzny to pitch out of the bullpen. Zastryzny will take the place of Mike Montgomery, who will take Lester’s spot in the rotation for the time being. Montgomery has pitched primarily out of the bullpen this year, but he’s also made eight starts for the Cubs. In those eight starts, Montgomery is just 2-3 with a 5.13 ERA. However, after a rough July, he’s pitched well during the month of August. Montgomery should provide the Cubs with a reliable stop gap if Lester only misses one or two starts. Of course, despite the team’s optimism, there are no guarantees Lester will come back quickly from shoulder trouble or a lat issue. Both issues have the potential to become long-term issues. That being said, the Cubs are counting on Lester being back soon, and they will certainly need him heading down the stretch. At the start of the day Friday, both the Brewers and Cardinals were within 1.5 games of the Cubs. A healthy and effective Lester will undoubtedly help the Cubs hold off both teams in a tight division race.